I recently installed Firefox 1.5 on my parents’ computer and was idly browsing for extensions when I came across Performancing. This is an extension that allows you to blog to WordPress, MovableType or Blogger from within Firefox! Experimental support is also there for LiveJournal and MSN Spaces or a custom blog based on known blogging APIs. I just found a flaw in this extension though. Actually it’s more like a lacking feature than a flaw. There is no way to delete or go back and edit a post you make through the Performancing extension. You will be forced to do that from within your regular blogging service’s interface. Also, there is no way to change the date and time of your post. 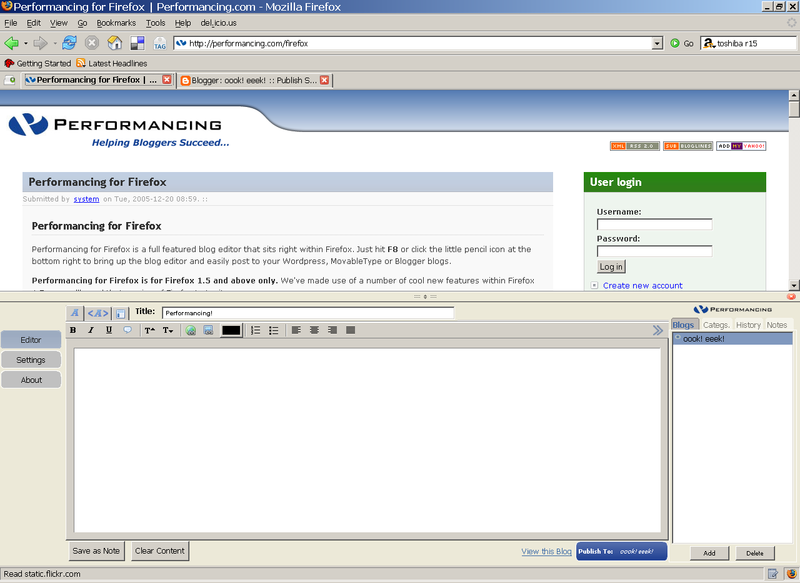 And, Performancing is only for Firefox 1.5. These are minor quibbles nevertheless, and considering that the extension is still in beta, its bound to get better! I’m already in love with it, although this is probably the last post I can make with it for a while since I’m heading back to Bombay tomorrow. But dammit, this is so coooool! Update: I’m just so stupid! There is a History tab which allows you to edit your last few posts and delete them even! I only wish it would not use so much of memory. Using Photoshop, opening a big powerpoint file and simultaneously surfing with mozilla is a sure recipe for a computer crash. Previous PostPrevious Do I look good in tights?